the fig house is born. i’ve been following the opening of the fig house los angeles for a while now. i first heard about it when stylist and interior designer extraordinaire emily henderson announced she would be taking on this massive renovation and design project. and man-oh-man did she get it right! the fig house is a gorgeous bespoke event venue nestled between downtown Los Angeles, and Pasadena in the heart of burgeoning Highland Park. Open to private events, outdoor weddings and receptions, exhibitions, productions, corporate and private parties, the fig house is an indoor/outdoor event venue that transports you to a place where midcentury California meets lush landscaping and modern glamour. emily and her team are responsible for that. it’s stunning, as you will see as you scroll through these photos. i next heard about the fig house again when bri from designlovefest posted stunning images from the cocktail mixology workshop she held there. bri hosts a range of DLF workshops — from basket making, to calligraphy, to social media and she always does it up right. the ambience she creates seems to be key for a good time while learning, and bri puts on a smashing workshop. this time around her mixology workshop was held at the fig house, which is Steve Fortunato’s (from Room Forty, an L.A. catering company) venture into the restaurant and hospitality world. way to dive in, in smashing style! as i was saying, emily henderson and her team, Dean Fisher and Ginny Macdonald are responsible for this incredible space, and you can see emily’s detailed before and after photos here, and here to get a sense of her design process and the scope of this really huge undertaking. to say the results are an amazingly stunning transformation is a complete understatement. emily enlisted the help of our own Danielle Krysa (real art for a fictitious world) from The Jealous Curator to curate the art for the space and her selections are simply spot on. i just want to say a massive kudos to everyone involved. what a dream team! you can visit images from the fig house opening night party and emily’s before and afters to be utterly inspired about what can come from virtually an empty space. i think you’ll be wowed. follow the fig house on facebook to check for upcoming events, or get in touch with them on their website to host your own smashing event there. Photo Credits: brittany wood for designlovefest; Mike Kelley and Ryan Phillips of Pure Photo for emily henderson; Our Labor of Love and Woodnote Photography for the fig house. Wow, I love how elegantly she put together all those brightly colored couches and chairs. They totally work together and yet still don’t come off as “rainbow.” Very classy. It’s beautiful! Is the wall color Farrow & Ball’s Borrowed Light? I have the same color throughout my place and these photos are giving me some great ideas… Thanks for the post! Nope it’s Teresa’s Green by Farrow & Ball (a really pale aqua). Kind of hard to tell in these photos. you did such a grand job with that artwork! Ditto. Do you get to fill physical spaces often!? Rock on. I must have a pink velvet couch. I love the fuchsia velvet fabric on the couch, and the awesome rugs. 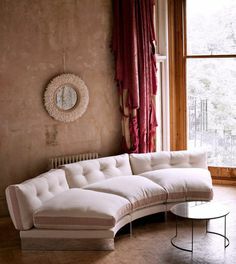 Is there a source for the fabric and the rugs? jules, if you check the link to emily’s site she’s got quite a few of her sources listed. Awesome! I pinned for the furniture, the art (! ), colors, inspiration! Is it just me or does it seem a little Wes Anderson? I love this space so much! Emily Henderson always manages to mix lots of bright colors together without it ever looking tacky. Her choice of furniture is always spot on too. Not gonna lie, when I saw the first shots, I found individual pieces I LOVED (those sofas!) but it was a little busy for me overall. Then I looked at the Before and After, my jaw dropped and I gained HUGE respect for Emily. How she turned A into Z with a million steps and pivots in between is really impressive. Wow. Everyone is so afraid of color, this is a perfect example of how gorgeous color can be when used in furniture, art and the walls. Wow I love this room! I’ve gone onto Emily’s website and had a read- how inspiring. Feeling v creatively motivated after seeing this haha- thank you!